There are three main phases of adolescent development: Identity (Who am I), Autonomy (How am I unique), and Affinity (Where do I belong). Marko uses these 3 phases to locate major shifts in youth culture and our ministry response. Early teen culture (1940's-1960's) was about answering the Identity question as they processed their own life experiences inside and outside the home. Youth culture shifted to prioritize Autonomy (1970's-2000), with Church helping them carve out their own uniqueness and contribution. As youth culture has progressed beyond Identity and Autonomy to Affinity, the Church is still answering the first two questions. "We adjusted to the first change in priorities (from identity to autonomy), but we've been slow in our response to the second change (from autonomy to affinity). Youth ministries are built on assumptions and values and methods that are outdated for the teenagers we passionately want to serve today." Youth Ministry 1.0 was dominated by guys like Billy Graham, evangelists in suits and ties who stood in packed halls and preached for hours to the youth. While the messages were largely condemning of the then-emerging youth culture, they still took the young people seriously and responded to them in a manner that attracted the youth. This era of youth ministry "was primarily proclamation-driven. Small groups didn't really exist yet... Youth ministry was primarily about preaching to teenagers." Youth Ministry 2.0 marks the shift to relational ministry, the birth of formal church-based youth ministry and of youth industries and marketing. Youth culture became confident as it became commoditized. It's priority shifted to autonomy, as the culture, sure of its identity, pushed back against, and defined itself in opposition to, adult society. Youth ministry was now program-driven, focusing on "Discipleship and Creating a Positive Peer Group" (hence the birth of Youth Specialties and Life Teen, Inc., etc.). 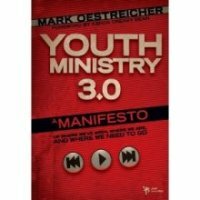 Youth Ministry 3.0 requires something different from us. Now youth culture is the dominant culture in America: moms in skinny jeans, dads with tattoos, kids and adults sharing similar media habits, and the stats that teens have the highest discretionary income in the U.S.! This shift has 3 parts: a pop-y, public face that is shared with adults; a private, subterranean face that teens keep to themselves; and the splintering of youth culture. There is no longer one dominant form of youth culture, no more social hierarchy. "The desire for autonomy was so successful (in a way) that it created an affinity vacuum. A monolithic youth culture (or youth group, for that matter) was no longer able to meet the affinity needs of teenagers." Marko believes 3.0's main driver, he says, it is "...not-driven. It's time to do away with being driven or driving... Instead, let's say: Present." While Catholics have copied Protestant youth groups for 50 years (our previous youth ministry being Catholic high schools) and have played down our ancient traditions, the emergent church movement is picking them back up! We need to return to our abundant traditions in order to re-evangelize and catechize our youth. The new evangelization in the Church can especially benefit from the final chapter of the book, with its key themes, intentions and insights into what needs to come next. Marko's advice? Do less. Get smaller. This is what I think is the "epochal shift" God is asking of us. Saint Therese and Mother Teresa followed this sacred model. Jesus is not asking me to love humanity, but this person in front of me, here and now; my neighbor and not the crowd. The parish of the new evangelization will be characterized by contemplative action and not by head-counts. In sum, get this book and let it bother you.